Not everyone has gotten around to scoring the ideal pair of over-the-knee boots. Believe it or not, I just got around to buying a pair on Black Friday. I already own a pair of high-heel OTK boots, so I was adamant about finding the perfect pair, sans the heel. I gotta tell ya, it wasn't easy, as the style is the season's top trend. For the most part, I could only find boots with a block heel, so I had to search high & low. Alas, I found the ideal pair at Macy's. 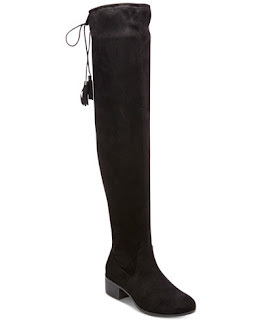 At $53.00, the Madden Girl Prissley Over-the-knee boots were a steal! Now, go back with me, if you will, to last month. I was going to a party, which meant I'd be drinking, which meant I'd be dancing, which meant, I needed to wear flats. As I stated above, the suede OTK boots that I already own have a high, almost stiletto heel, so they were out. I tried them on, and after one botched attempt to "drop it like it's hot" and I immediately knew that I needed a plan b. I didn't want to have to switch up my entire look, so I took a second to think, and then came my "aha' moment. 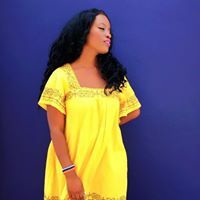 My romper was an itty-bitty thing, and although it looked to be a mini dress at first glance, it was actually shorts, therefore, I was already wearing a pair of sheer black tights. I threw on a pair of thigh-high socks over my tights, and finished off the look with my favorite pair of black ankle boots. Just like that, I had DIY'd the over-the-knee trend, minus the boots! Genius!